Read the main Hartmann page and see similar early U.K. towels (menstrual pads) by Mosana. Assuming the date 1888 is correct, this is maybe the first disposable pad, earlier than Hartmann. But information keeps appearing so the final story has not yet been written. The company early used an apostrophe in two different positions - see below - but today uses none. I want to add to your discussion about when the first commercially sanitary napkins appears on the market in the States or Europe, see your page http://mum.org/southall.htm [this page]. The makers of sanitary towels were faced with the problem of how to advertise them [a problem the makers of perhaps the earliest American maker of pads had]. The principal manufacturers, Southall Brothers and Barclay of Birmingham, often selected the oddest sites for their advertisements; the desire to avoid offending sensibilities had run riot. Surely there can have been few more unlikely spots than the Antiquary of July 1888, in which Southall Brothers took a third of the back cover. The advertisement was addressed in large sans serif letters to 'Ladies Travelling by Land or Sea' [see the ads below] and the items were 'patented Articles of Underclothing, Indispensable to Ladies Travelling. Sold at Cost of washing Only! To burn when done with. This fits exactly with the same sort of ad you put on your site, so I think the date you were given of 1888 is correct. NB: I don't agree with Pearsall about the unlikely spot. Women who could afford the advertised sanitary towels were not working-class women but ladies in the true sense of word: with plenty of time, not the right to work (after all the Victorian world, no suffragettes at that time) but arts, doing good to the working class (Red Cross, church work) etc. were acceptable. I have reasons to believe this is not the first year of production of Southall Brothers. The ad on your site suggests that the company was well organized, has the praise of medical professionals (doctors, nurses), has a department run by only women and so on. It suggests more years of production, etc. Also maybe the first trading was via the shops, druggist etc. from woman to woman and not advertising in journals, etc. Maybe 1881 is the first year of production. I will try to prove it: I send you with this email a scan of a two-page ad with the title "Have you ever wondered how men would carry on if they had periods?" The ad is for Dr White's towels and tampons. 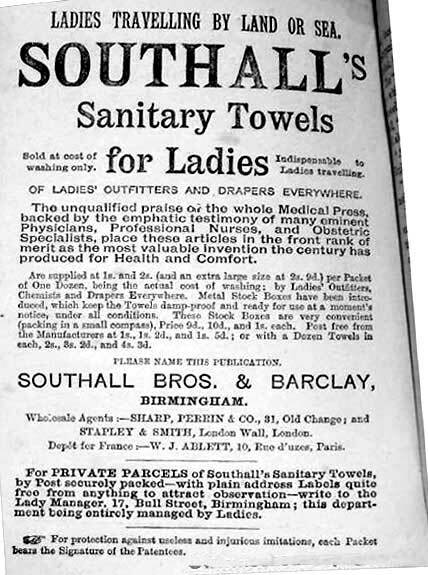 This is the same company of the 1888 advertisement, Southall Brothers. The ad appeared in April 1985 in a leading women's magazine of the UK, Company. The ad itself is humorous with British style, with a man clad only in women's lingerie . . . . Interesting is the claim they make: "After 104 years in the business, we aren't naive enough . . . ." If you subtract 104 from 1985, you have 1881!! I am absolutely sure about the year of publication of the ad. I have more ads with the moons in the corners of the same year (e.g. the Liechtenstein ad with the man thinking: "I just hope, my darling, that this will last forever" ... and the woman thinking: "I just hope this towel lasts till I get home" of October 1985 in the other leading UK woman magazine, She). 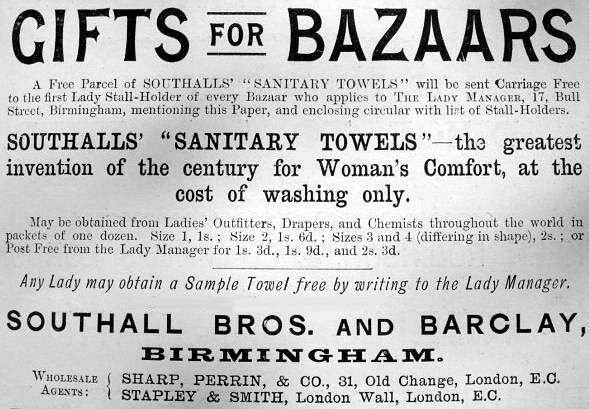 So the successors of Southall Brothers claim they were in the business of female hygiene from 1881 onwards! Maybe you can ask readers from the UK to comment on this!! And also: maybe German readers have information about the first years of production of Hartmann! I thank the Web site sensationpress.com, a good source of Victorian pulp fiction and other Victoriana, for allowing me to use their scans of these British ads! I thank Ben for the scans of the American ads! Below: from a paperback novel published by the Hansom Cab Company, about 1888. The donor photographed the ad at an angle, thus the distortion, which I corrected somewhat. In the ads below there's a constant comparison to the cost of washing - meaning washable pads. When other information is lacking that indicates the pad is disposable. 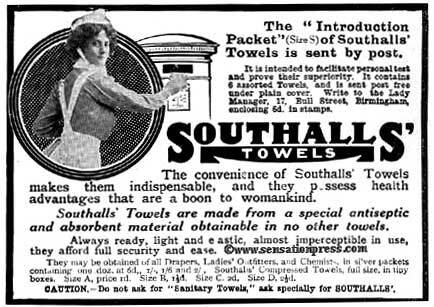 See American ads for Southalls' - the main Hartmann early disposable pad page and see similar early U.K. towels (menstrual pads) by Mosana.